13th’s and Sweet 16th’s a speciality! Mini Nightclub Experience. We are teen experts! It’s the biggest party of the year, choose the best disco in the area, it’s well worth it! 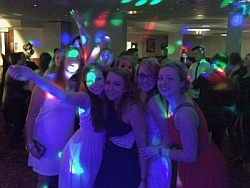 Be it a Prom, School Disco, Sweet 16 or Birthday Party! 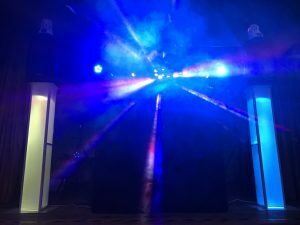 Too many young person discos are just a DJ and lights on a table, not us! We bring the FULL works! Kids & especially Teens these days are super switched on and need a DJ who knows what they are watching on YouTube and Instagram. 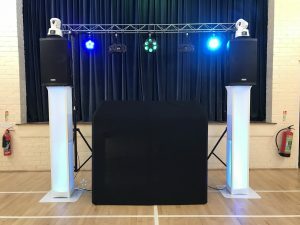 We are a higher end disco, for those that want to throw a party to remember. Accept no compromises! For Teens: Drake, George Ezra,etc, all their favs! We can cover Dance, House, R&B, Hip Hop, Indie, Grime, as well as ‘chart and party’, the music is tailored to the age group and tastes. We know what ‘dabbing’ and ‘flossing’ is! 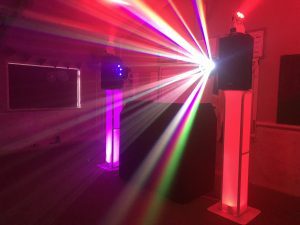 For Young Adults: We know how to throw a great party with music that’ll set the floor on fire, with lightshow and sound system to match. Dance, EDM, Trance, Cheese, House, Trap, Grime, R&B, Hip Hop, Indie, Rock, we’ve got it covered! Proud to have worked in 2018/19 with: Anstey Young Farmers, Braunton Academy, Axe Valley Academy, Bicton College, Exeter University, West Exe School, Ide Primary, Topsham Primary, Chudleigh School, Cheriton Fitzpaine School, Clyst Heath School, West Cliff School, Globe Language School, Ladysmith Schools Federation, Bowhill School, Hemyock Primary, Copplestone Primary, amongst many others. 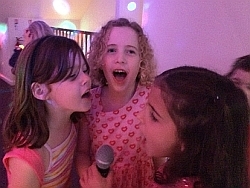 The best choice for parties for the younger generation! With top sound system & massive light show, including lasers, kaliedo effects, smoke, bubbles, snow machine, party games. – Enhanced DBS (CRB) Checked with Devon County Council Fostering Team and The Scout Association. Areas covered: Devon, Exeter, Torquay, Plymouth, Okehampton, Budleigh Salterton, Honiton, Seaton, Starcross, Barnstaple, Crediton, Tiverton, Exmouth, Dawlish, Teignmouth, Paignton, Taunton, Chard, Kenton, Cheriton Bishop, Spreyton, Throwleigh, Hatherleigh, Holsworthy, Chagford, Moretonhampstead, Bridford, Whimple, Talaton, Newton Poppleford, Woodbury. Ash Thomas, Feniton, Whimple, Broadclyst, Bickleigh, Chudleigh, Moretonhampstead Hall, Sidmouth, Sidbury, Woodbury, Ivybridge, Totnes, Otterton, Kenton, Kennford, Silverton, Butterleigh, Bickleigh, Willand, Calverleigh, Teignmouth, Ashburton Town Hall, Exminster, Holcombe., Umberleigh, Lapford, Exeter, Torquay, Exmouth, Newton Abbot, Cranbrook, Okehampton, Honiton, Barnstaple, Crediton, Tiverton, Dawlish, Teignmouth, Paignton, Taunton, Cullompton, Bridgwater, Sampford Peverell, Uplowman, Launceston, Totnes, Lyme Regis, Uplyme, Bridport, Dorset, Somerset.